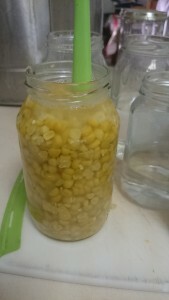 This is our second post in the Preserving the Harvest Series and this one is on sweet corn. 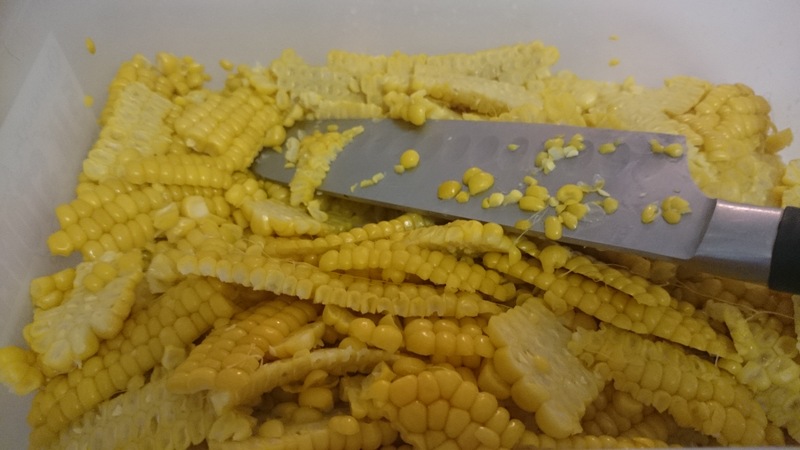 In Australia it is not recommended to put corn through our water bath system (Fowlers Vacola). 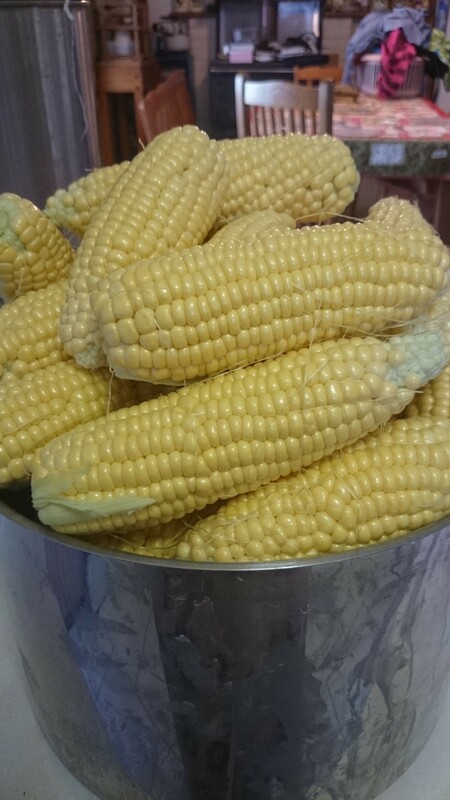 It would be suggested that corn be frozen, but our freezers are filled with meat and I don’t have room to store vegetables as well. 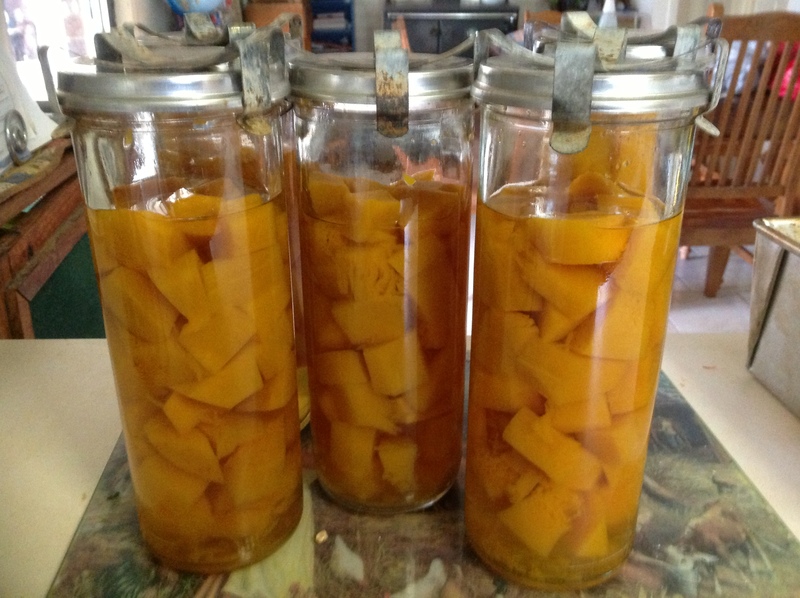 I am so blessed by the canning system and that an import company arranged to get canners in from America to make it easier for us Australians. 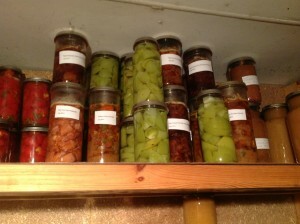 I would suggest to anyone with heaps of produce that canning is the way to go. I use our Fowlers bottles in my canner as well as recycled screw top bottles. 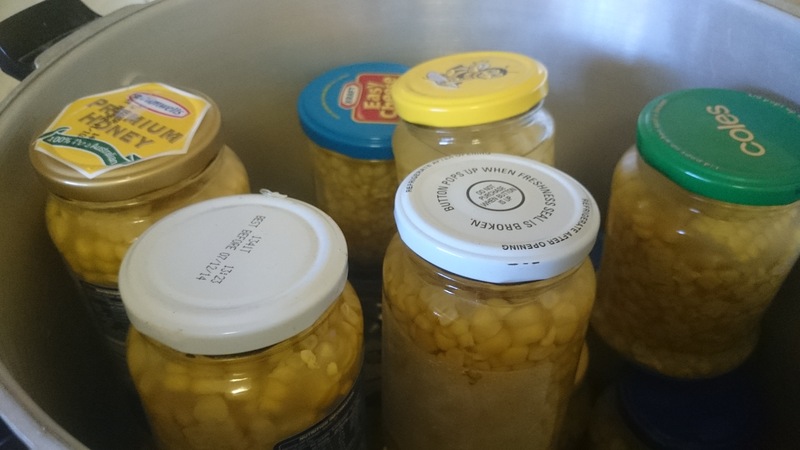 If I am preserving meat I use our big bottles but when it is corn or peas I only need smaller amounts for stews so I need a smaller bottle. We are in the middle of picking our Sweet Corn and I have started canning it, and we are eating heaps just boiled (my husbands favourite way of having it). First of all we shuck the corn (I think that is the technical name) and we give all the shuckings (is this right???) to the pigs. 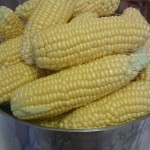 Then we bring it inside and blanch the corn for a few minutes. 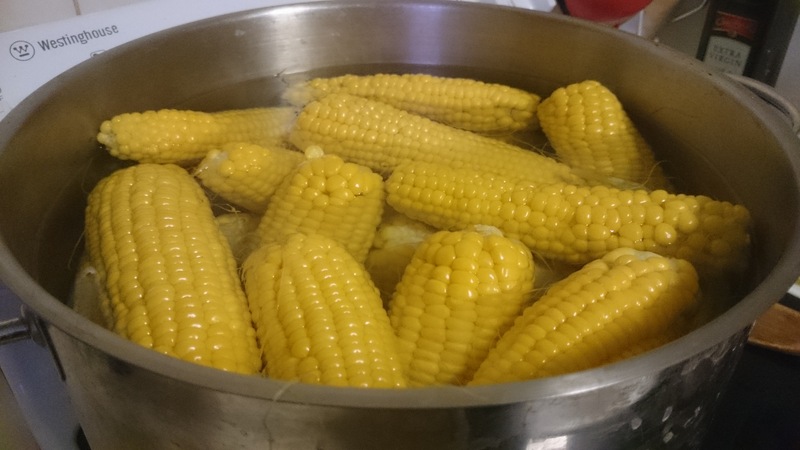 I had such a hard time getting my water to boil that I just put all the corn into the pot and brought it to the boil. 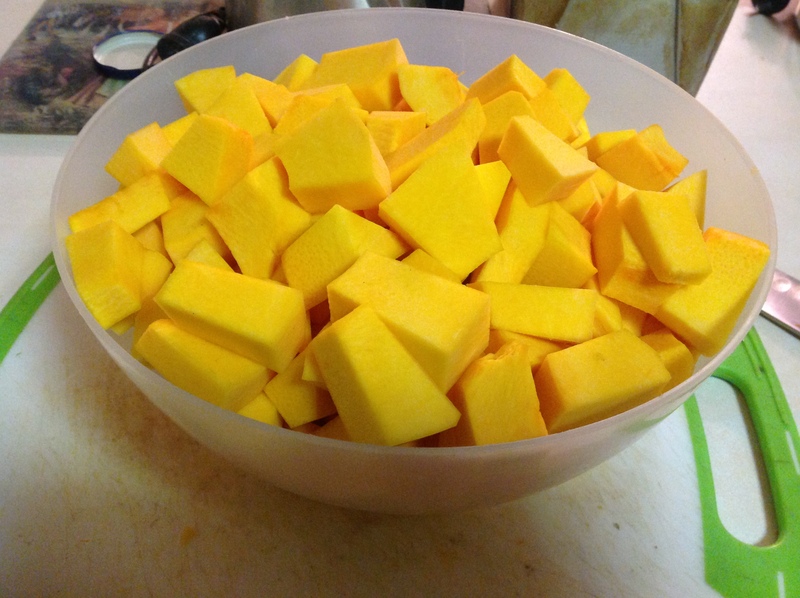 After it has been blanched I let it cool and then I cut the kernals from the cob into a container. 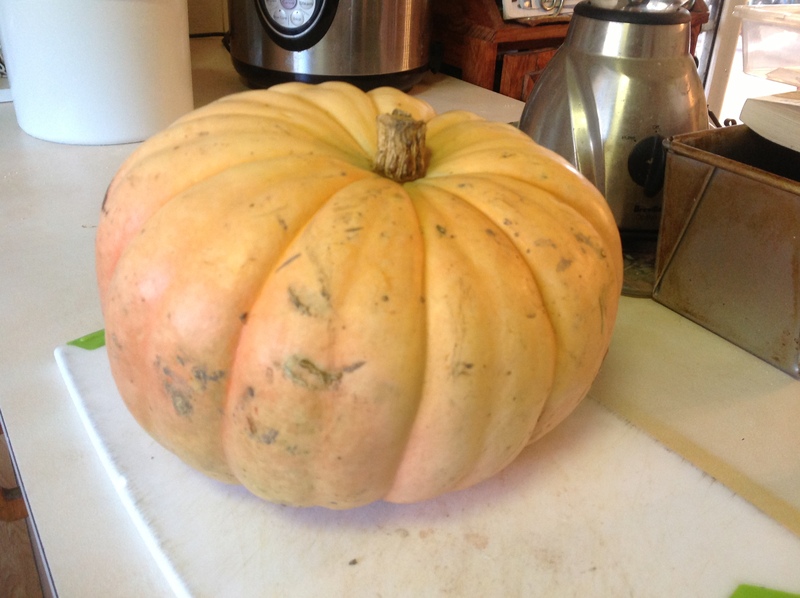 Over the past years I have tried various tools for this but now I just use a sharp knife and this works well. 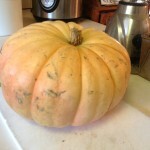 Here it is in the container once it has been cut off the cob. 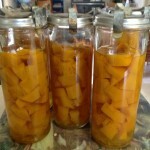 It is good to get rid as much of the silk (hair) as you can before boiling. 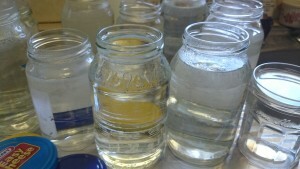 Then I get my jars ready and filled with hot water so they warm up. Here they are ready to go. I use recycled jam and honey jars as well as any bottled sauce jars that I can scrounge off friends. 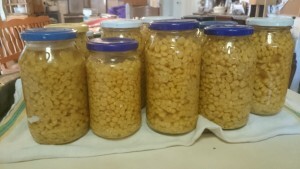 I have heaps now which is good. 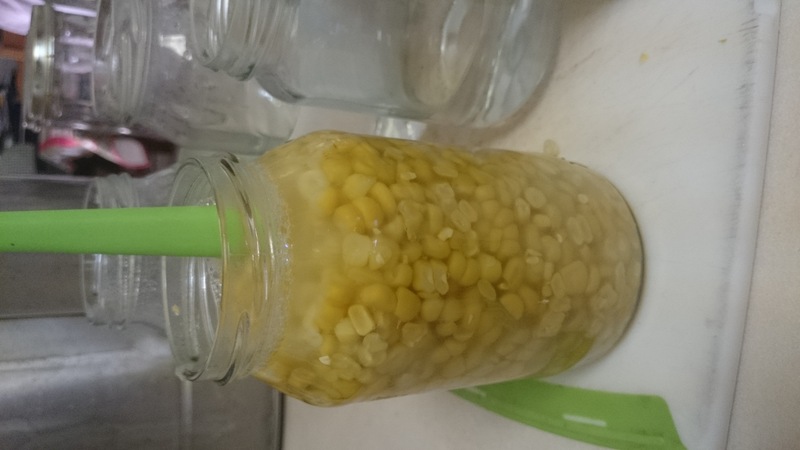 Now I tip out the hot water and add the corn and then fill the bottle with boiling water leaving the recommended head space. 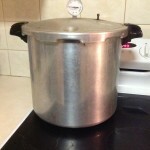 The green handle is used to get out any air bubbles. 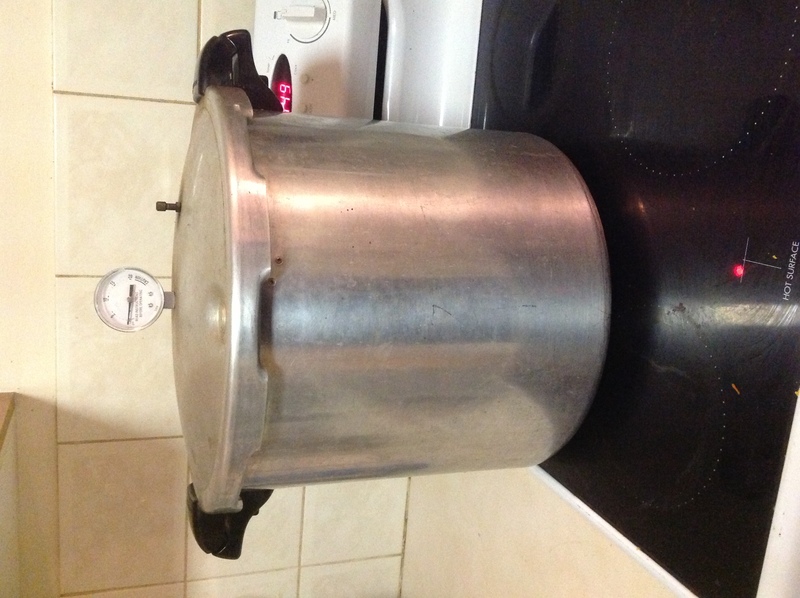 I then put on the lid and place in the canner. 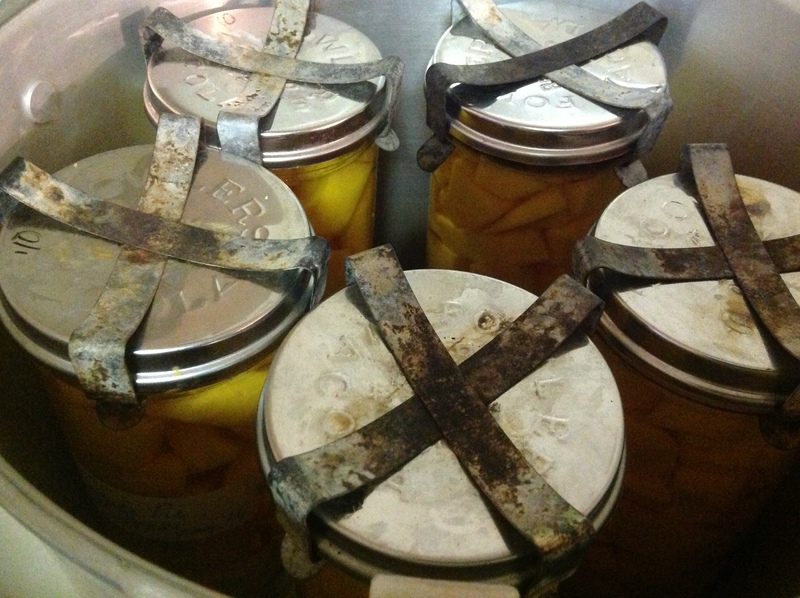 Here are the 17 jars in the canner, you can see the recycled lids. 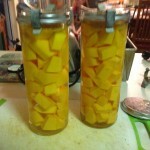 I have doubled layered these and you just need to be careful not to knock them over as you move the canner. I then follow my canner instructions in the booklet provided, it took about 60 minutes to process these bottles. 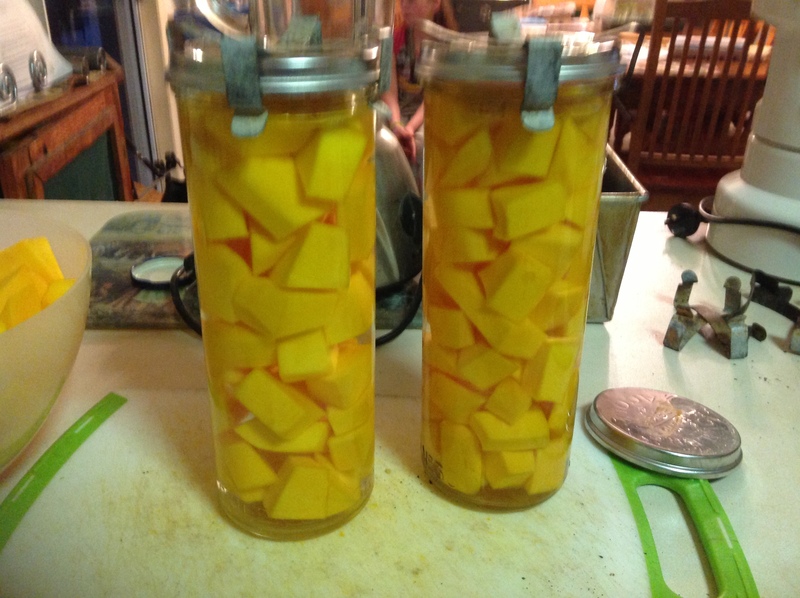 The larger the bottle the longer the processing. Once the canner is finished and the pressure has gone (never open before the pressure is released) I take out the bottles and put on the bench to cool off. 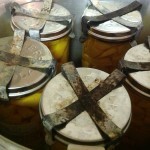 The lids will pop in and show that they are sealed, mine were quite noisy this year. 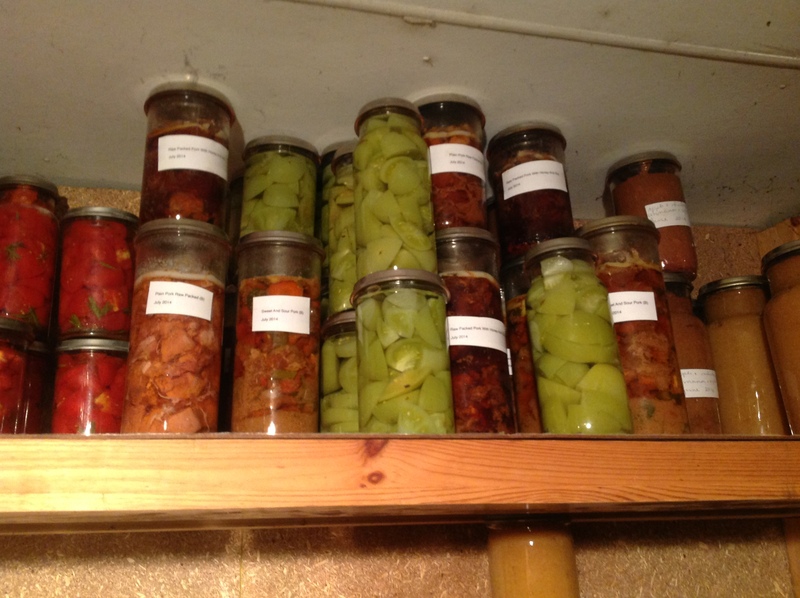 I am weird I think because I really enjoy canning and I love seeing all my jars in my pantry, but I have a hard time using them in case I run out. 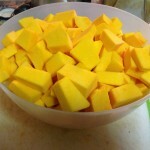 Last year I did soups and stews and carrots and pumpkin and I have some of these left, so maybe I will just have to start using them, so I can fill the bottles again.